You know, sometimes all it takes to turn a controversial rejected video into a potentially hot video is the right inspiration. On November 15 2011, the Canadian Radio-Television and Telecommunications Commission (the CRTC) has released their latest decision on Usage-based billing. The CRTC has decided to implement new usage tariffs on Internet services in Canada. We’re still reviewing the new tariffs which, regrettably, are overly and unnecessarily complex. It’ll take a while to understand how any of these new tariffs can be manipulated to anyone’s advantage. On October 5 2011, the Canadian Radio-Television and Telecommunications Commission (the CRTC) published the Results of the fact-finding exercise on the over-the-top programming services. As a result, the CRTC will not recommend that any new taxes or levies be implemented, and will maintain their current “hands-off” approach over the Internet in Canada. Originally published on August 11, 2011. Last updated on September 7, 2011, with contributions by The Mark News. (easier to read streamlined version available here). On May 25, 2011, The Canadian Radio-Television and Telecommunications Commission (the CRTC) published a Broadcasting and Telecom Notice of Consultation 2011-344, launching a fact-finding mission on today’s Over-The-Top programming services and their potential impact on the Canadian entertainment industry. This exercise could result in the modification of the CRTC’s previous New Media exemption orders which continue to promote a “hands-off” approach to regulating most new media technologies. On the surface, the CRTC’s proposed exercise does sound reasonable. Internet streaming video services such as Netflix, Hulu Plus and Amazon Prime have become so popular in the United States since the CRTC’s exemption orders were originally published two years ago that it has become necessary to evaluate the potential impact these new services could have on the Canadian entertainment industry, and on Canadian culture. Already, Netflix has gained over a million Canadian subscribers since last year’s launch of their on-line video streaming service. 8. Further, the Commission received a letter dated 1 April 2011 from the “Over-the-Top Services Working Group.” The working group describes itself as “35 private sector executives from the distribution, telecommunications, broadcasting, production and creative sectors in Canada.” The group has noted a growing role for foreign OTT services in Canada. It has suggested that the Commission should initiate a public consultation as recommended by the Standing Committee on Canadian Heritage as described above. A copy of this letter has been placed on the record of this proceeding. It appears the CRTC is considering recommending that the federal government levy a new tax against all OTT service subscriptions, based on the premise that the money is needed to help “support Canadian cultural programming.” This tax was indirectly proposed by the Standing Committee on Canadian Heritage, and is supported by members of the rather secretive “Over-the-Top Services Working Group”, or “The 35” as I like to call them. Historically, similar taxes and levies have been introduced by various Canadian governmental departments with mixed results such as for example the levy imposed on blank recording media CDs, presented as a means to “support” Canadian music creators even though blank compact discs are often used for non-music related tasks. One immediate and significant problem with this proposed new tax on OTT services: it would only apply to OTT services with a Canadian business presence. US-based Netflix, the largest OTT service in the world, has no official business presence here in Canada, and is out of the jurisdiction of both the Canada Revenue Agency and the CRTC. Netflix isn’t legally required to collect any Canadian sales tax, pay any Canadian corporate tax, or even comply with any Canadian content requirements. However, foreign-based OTT services such as Netflix already suffer from a major disadvantage: a lack of Canadian Web broadcast and distribution rights to the most popular content, namely movies and TV shows. Many of these Canadian on-line broadcast rights are already held by Canadian broadcasters and cable/satellite providers, leaving foreign-based OTT services with very little material for their Canadian customers. If the goal of the tax is to protect Canadian content, then it is missing the mark, because it will be unable to target precisely the companies that are supposedly causing the problem. This suggests The 35 must have a different goal in mind, with the foreign OTT services being nothing more than a red herring. Large Canadian corporations already own a wide range of Canadian production, broadcast, distribution, and internet-access services, and are now launching their own subscription-based OTT services. Any taxes collected from their OTT subscribers would be returned to the corporations in the form of Canadian production funds. This means that, as a user, you would not only pay a monthly fee (plus sales tax) to the Canadian OTT service that has the content you want to watch, but you would also be charged an extra tax that would be handed over to various divisions of your OTT provider’s parent corporation. Furthermore, the application process for these production funds could be rigged in such a way that any independent producer not properly “partnered” with any of the corporations represented by The 35 would never qualify. The scheme would ensure that The 35 would not only receive all of the tax money collected from their own OTT subscribers, they would also receive the tax money collected from the few independent Canadian OTT subscribers struggling to survive. This money could be spent in any manner the recipients see fit including the possibility of paying salaries and bonuses to high level managers and directors before spending any money on actual content production. Foreign-based OTT services such as YouTube, Vimeo and Netflix are already stealing customers away from the existing cable television services of The 35, not only by offering a wider selection of high quality entertainment choices, but also by allowing Canada’s next generation of content creators to independently publish high quality Canadian content on-line, completely bypassing the “walled garden” style corporate infrastructure of The 35. Perceiving this as a threat against their control of the Canadian entertainment industry, The 35 have asked the CRTC to study the possibility of taxing OTT services, with the expectation that this new revenue stream will find its way back into their hands in the form of production funds. Furthermore, the fact that usage-based billing and aggregated volume pricing of The 35’s Internet services will very likely not be applicable to their OTT services means that, in comparison, the continued use of foreign OTT services could become so expensive that most Canadians might have no other choice but to retain the services of The 35 – as chosen and priced by The 35 – whether they like it or not. The CRTC already has a history of ill-conceived and counterproductive regulatory decisions such as for example the implementation of their Signal Substitution policy back in 1972. The original intent of the policy was to protect the Canadian broadcast rights of highly profitable foreign content delivered over cable television, and use some of the extra ad revenue generated by these enforced exclusive broadcasts to fund the production of high quality Canadian content. But instead of encouraging the production of Canadian content, signal substitution has become such a monumental cash cow for the private broadcasters that they removed nearly all Canadian programming from their prime time schedules, replaced it with highly lucrative foreign programming, and now only spend enough money on Canadian productions to meet their Canadian content requirements, content often broadcast at times when Canadian television audience ratings are at their lowest. And now, history is about to repeat itself. 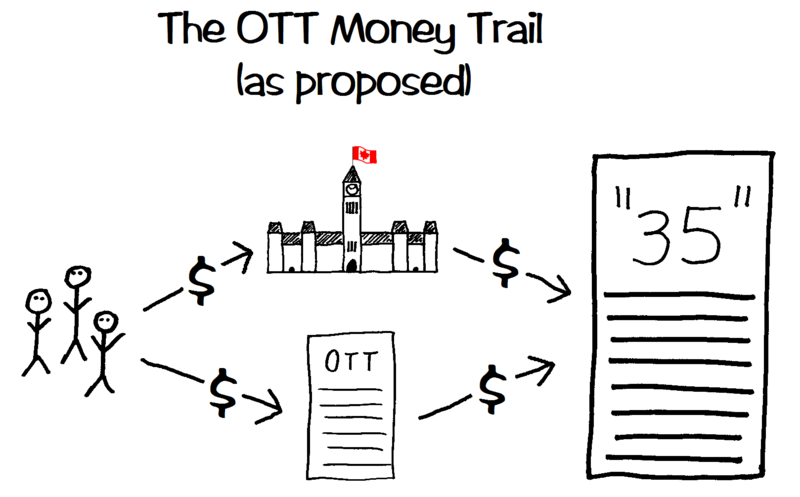 If implemented, this highly deceptive OTT taxing scheme will fleece Canadians, limit their entertainment choices, fill the coffers of large corporations, and further reduce the amount of viable Canadian content. This is not only another fine example of regulatory capture, it could also be viewed as a form of legalized embezzlement – one that has the potential to be approved by the CRTC. Originally posted on July 28, 2011. Last updated February 14, 2012. September 12 2011 update: Pretty River Academy, a private kindergarten/grade 12 school located in Collingwood, Ontario, has banned Wi-Fi from their premises, basing their decision on the same flawed research data used by Elizabeth May. The school will instead use wired networking technology to provide Internet access to their students, increasing the chances that someone will be injured tripping over a loose network cable. February 14 2012 update: the Ontario Catholic Teachers Association is also proposing a ban on Wi-Fi in Ontario Catholic schools. Ignorance truly has no borders. — Tweets posted on Twitter by Elizabeth May on July 27, 2011. The moment I read those tweets by Elizabeth May, leader of the Green Party of Canada and MP for Saanich-Gulf Islands, I was furious. Once again, a politician learns a bit of “scientific information” from undisclosed and questionable sources, and suddenly becomes opposed to technology that has existed in various forms since 1887. Her beliefs on the alleged effects of Wi-Fi radio signals on the human body are so wrong, she has discredited both herself and her party. Be advised however that radio waves can be dangerous if you do something silly such as lean against a commercial radio or TV transmitter, which are powerful enough to cook you in the same way a microwave oven cooks your food. But move just a few meters away from the antenna, and these same radio waves quickly lose their ability to heat you up. Unlike radio and television transmitters however, the radio waves generated by cell phones, Bluetooth headsets and Wi-Fi routers are so weak that, even with the antenna resting against your body, any heat generated by these devices is immediately dissipated by your body’s internal cooling system. But what exactly are radio waves? Here’s a simple primer. 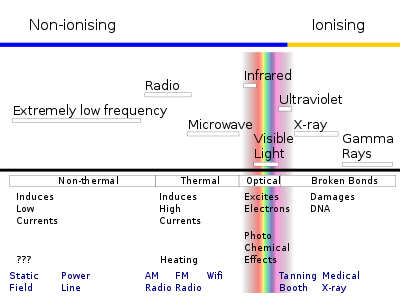 Radio waves are a form of radiation whose frequency range is located below the visible light spectrum. 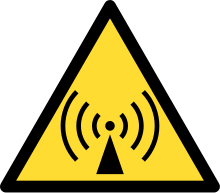 Radiation in this area of the frequency spectrum is known as “non-ionizing radiation.” The only injuries this radiation can inflict on you are burns, and only at extremely high power levels close to the transmission source. Ionizing radiation however begins at the frequency of ultraviolet light, and at high levels will definitely play a bad game of ping-pong with your body. This form of radiation will alter the bonds between your atoms, modifying your body’s molecular and DNA structure, and potentially create nasty forms of cancer that can kill you. Even ultraviolet light, the lowest form of ionizing radiation in the frequency spectrum, is powerful enough to give you a sunburn and potentially skin cancer. The type of radiation that worries Elizabeth May the most is non-ionizing radiation generated by Wi-Fi devices whose power levels are so weak that, based on existing research data, are completely ineffective at damaging you in any way. Radio technology has existed for well over a century, and has helped transform our world in ways no one could have ever imagined. Information that once took months if not years to be disseminated is now being distributed at the speed of light. Information on how to improve our health and our lives is now readily available, and has dramatically increased our life expectancy in under a century. Unfortunately, radio technology has also made it possible to disseminate false and misleading information about these very same technologies. For example, Elizabeth May posted her anti-Wi-Fi tweets from her BlackBerry. Knowing that there’s still no conclusive and replicable evidence to demonstrate how cell phones can have any adverse long term effects on the human body, how can a Wi-Fi radio operating at one-tenth the power level of a cell phone have any noticeable effect on you and your family? Whenever someone in a position of authority and influence manipulates scientific research for their own personal gain, it harms us all. The dissemination of false and misleading information not only instills unnecessary fear in the population, it can also have serious and potentially fatal consequences. And with many people now realizing that Elizabeth May’s views on the dangers of Wi-Fi radio signals are completely wrong, will they now believe that her views on Global Warming might also be wrong? Some politicians really need to think before they tweet. Also available in written form on The Mark News. This is an unofficial video rebuttal to Telecom Notice of Consultation CRTC 2011-77 – Review of billing practices for wholesale residential high-speed access services. But first, you might want to find out Why I’m Not Participating in the current round of hearings. This unofficial rebuttal is what I would have presented to the CRTC proceeding if I were capable of doing so. Be advised however that this practice video might be a bit rough around the edges. But that’s okay since one day, I will have to do a presentation in front of the Commission, and these videos are excellent training tools. Yes, the video does include new ways of seeing certain elements of our technology that may appear a bit unusual at first, but do consider the possibilities. And to better understand the full implications of Usage-Based Billing on our society, please watch the video that officially launched this Web site and my personal campaign against all volume based Internet billing schemes. For reference purposes, here is the CRTC rebuttal text. However, I wouldn’t advise anyone to actually read it at the CRTC proceeding. Hello, I’m François Caron, and I’ve been following the CRTC Usage-based Billing and Aggregated Volume Pricing proceedings for a few years now. And I must say that I’m extremely disappointed that such a deceptive and potentially fraudulent concept for an Internet billing scheme has survived for this long. Despite not having made a presentation in front of the CRTC, I still felt the need to record a video rebuttal for the current proceeding, and possibly help clarify a few of the many misconceptions that have been disseminated over the years, and which I regret to say the intervenors opposed to “billing by the byte” have failed to thoroughly denounce during their many appearances in front of the Commission. Unlike other products we buy every day, data is neither a manufactured product, nor a consumable product. Data is nothing more than a series of electrical signals travelling through a bunch of wires over short and long distances. The presence or absence of these signals barely has an impact on the networking equipment. The equipment’s operating environment however has a much greater impact on the operating costs than the data flowing through it, especially with outdoor equipment where the elements have a real impact on operating costs. Data volume has such a low impact on networking equipment that it can be considered as non-existent. What would happen if demand for Internet services reached the maximum capacity of a provider’s network? The networking equipment would simply not go any faster. This is why Internet congestion doesn’t really exist. Congestion implies that the “pipes are dirty” and you need to “clean them up.” But computer networks don’t work this day. What happens to a network pushed to its limits is that it just keep pushing data through as fast as it can, with any extra data packets wanting to go through now required to wait their turn. If the network’s speed usage patterns have been properly calculated and configured into the system, the network’s actual traffic degradation could be so low that very few people will every notice that anything is wrong. Third. Billing by the byte is unreliable. It’s reasonable to believe that if independent ISPs are charged AVP fees by the large telephone and cable companies, the ISPs will most likely pass those costs to their customers in the form of UBB fees. And this is what might happen. At the beginning of each billing cycle, everyone overuses their Internet connection to take advantage of their available monthly caps. The network maxes out, and everyone’s Internet experience is severely degraded. Now it’s the end of the billing cycle, and everyone rushes to consume what’s left of their monthly caps. The network maxes out once again, and everyone’s Internet experience is severely degraded. Usage-based Billing could make it next to impossible to properly configure and manage a data network due to these wild fluctuations in data usage. But on a speed-based network, there is no need for anyone to binge on huge volumes of data during certain times of the month. Everyone uses the Internet at their own pace with no worries about caps, resulting in comprehensive usage patterns suitable for most network management requirements. In fact, speed based measurements are so reliable that they can also be used for billing purposes, and for calculating the true operating costs of networking service. Volume based measurements are useless for these critical business objectives. Fourth. Billing by the byte might be illegal. I’ve contacted Measurement Canada a couple of years ago about the use of bytes as a unit of measurement for the purpose of trade. I was informed that bytes aren’t in Measurement Canada’s list of approved units of measurement, and that they do not regulate the use of bytes for the purpose of trade. But considering the huge revenue streams that would be generated through the implementation of faulty UBB or AVP based pricing schemes — on top of the existing subscription fees — it’s not impossible that this large scale use of an unregulated and highly inaccurate unit of measurement could be considered as fraud. The Commission might want to look into this. These are just a few examples of what’s wrong with Usage-based Billing of Internet services. It is a highly deceptive and potentially destructive billing scheme that should have never been considered or even taken seriously in the first place. If you would like more information on how Usage-based Billing can be used not only to empty our wallets, but also to compromise our freedoms and our democracy, please visit my Web site at The UBB Deception dot com . I’m François Caron, thank you for watching. On July 11, the Canadian Radio-television and Telecommunications Commission — the CRTC — began hearings on Telecom Notice of Consultation 2011-77, a review of the future billing practices for wholesale residential high-speed access services. In other words, the Commission is reviewing their past decisions on Usage-Based Billing (UBB) and the now proposed Aggregated Volume Pricing (AVP) before either billing method has even been implemented. I chose to not participate in the current CRTC proceeding. Here’s why. First, it’s important to understand that a CRTC proceeding is a rather restrictive government process. All public notices of consultation deal with a single issue. For example, this particular CRTC proceeding deals specifically with “Aggregated Volume Pricing”, or how the owners of the “last mile” network (i.e. the phone and cable TV lines) will bill independent Internet service providers for access to the “last mile” connection to your home. AVP is offered as an alternative to the original UBB proposal of billing for “data consumption”. Participants in CRTC proceedings (officially known as “intervenors”) aren’t allowed to discuss any other subject matter even when these subjects are heavily intertwined with the current proceeding. As a result, the different business divisions of vertically integrated corporations are shielded from one another from a regulatory point of view. Even if you had solid evidence that UBB or AVP is exploited not only as a cash grab, but also as a means to slow down the progress of competing Over-The-Top (OTT) services such as Netflix, you’re not allowed to discuss or even mention OTT at all since they’re not part of the current proceeding. So while the large media corporations have the luxury of working with both the forest and the trees, the CRTC restricts everyone’s field of vision to individual trees only. It doesn’t matter if UBB, AVP, telephone, cable TV, VOD services and OTT services are all mutually interconnected from the point of view of a large corporation. This proceeding is specifically about AVP and nothing else regardless of any correlation with any other services. The large corporations have been exploiting this cross-subject protectionism to their advantage for decades. Pretty much anyone can submit written comments to the Commission via the Internet in regards to any of the proceedings currently open for discussion. You can also request to present your comments in person to the Commission. If the CRTC accepts to hear your comments in person during the hearings, you’ll need to prepare a five to twenty minute presentation (usually ten minutes) to be made either in front of the Commission or via on-line video conferencing from one of the CRTC’s regional offices. Such presentations can take days if not weeks to prepare. It’s very easy to create a detailed presentation when the length of the presentation isn’t a factor. But when your presentation time is limited, you soon discover that ten minutes is equivalent to a three page document. You find yourself spending an insane amount of time trying to get all of your points across within three pages without sounding like a complete lunatic. And even if you do manage to present your point of view in the allotted time, you still need to back up your statements with evidence. You can’t just say “such-and-such-company is doing this because of that.” You must demonstrate how you’ve reached that conclusion by properly presenting all of the details of your evidence in your accompanying documents. It’s not unusual for some presentations to take weeks if not months to prepare, which is why most presenters consist of large corporations that can afford to assign large teams to the time consuming task of preparing the presentations and documenting the evidence. It’s also possible for a business to submit evidence to the CRTC in confidence if the business believes that public disclosure of said evidence could give other businesses a competitive advantage. This is a common request when the submitted evidence includes the company’s own internal numbers such as bandwidth usage statistics and operating costs. This means the CRTC will accept evidence submitted in confidence, which automatically denies other participants the opportunity to review, analyze, and potentially discredit the submitted evidence. This shroud of confidentiality gives predominantly large corporations an opportunity to strategically lie to the Commission, with little or no chance that any of these lies will ever become public knowledge. And even if such lies were uncovered at a later date, the huge revenue streams created with the help of falsified data submitted to the Commission will more than make up for any penalties and fines levied against the guilty parties. As for the competition, any bad decision made by the CRTC would have put them out of business long ago. They are no longer relevant. Here are the Commissioners presiding over the current hearing, along with some of their past work experience before joining the CRTC. Chairperson Konrad von Finckenstein: civil servant since 1973, various positions. Vice Chairman Tom Pentefountas: two years with CKDG-FM Montreal, five years with the Action Démocratique political party. Commissioner Timothy Denton: two years with CIRA, two years with CAIP, two years with the Minister of Communications. Commissioner Michel Morin: eight years with the CBC. Commissioner Marc Patrone: 14 years with CTV. Commissioner Candace J. Molnar: more than two decades with SaskTel. Commissioner Leonard Katz: 17 years with the Rogers Group, 11 years with Bell Canada. Have you noticed the particulars of the last two Commissioners? A combined fifty years of experience with large telecommunications corporations, corporations that have the most to gain with the forced implementation of Usage-Based Billing style payment schemes on all Internet service providers. This is a monumental conflict of interest. There is absolutely no way to be certain if Commissioner Molnar’s and Commissioner Katz’s past experience with large telecommunications corporations may or may not influence their ability to reach an impartial decision in the current proceeding. Even if they swear under oath to not let their past experience influence their decision in the current proceeding, they still have the potential to be influenced subconsciously through their ties with former colleagues and current friends and associates. They also have the potential to consciously or subconsciously influence the other Commissioners presiding over the same proceeding. Commissioner Timothy Denton is also in a potential conflict of interest for his previous experience with a domain name registry and an ISP advocacy group, although that combined experience is limited to a total of four years. These conflicts of interest are analogous to a courtroom proceeding where the judge or a member of the jury is or has been personally involved with either the prosecution or the defence. Such individuals would be required to withdraw from the case due to the huge potential for bias and preferential treatment towards either side of the case. But with the CRTC, there is no requirement for a Commissioner to withdraw from any of the proceedings due to a possible conflict of interest with any of the interested parties. How can I possibly present an effective argument against UBB and AVP if some of the Commission’s own members might have already reached a decision before the hearings have even begun? But even if there were no conflicts of interest in the higher echelons of the CRTC, that doesn’t mean UBB or AVP could be more easily defeated. One thing I’ve noticed during past CRTC hearings is that the consumer panels and public advocacy groups are for the most part extremely poor presenters. Poor pronunciation, poor pacing, poorly worded presentations… Even when the participants manage to deliver an excellent presentation in front of the Commission, many individuals quickly go from “hero” to “zero” when the Commissioners start asking questions. The participants struggle to answer the questions in a clear and concise manner, with their presentations completely destroyed by their inability to answer even reasonably simple questions. The problem is that individuals or public advocacy groups can be so convinced over the validity of their own arguments, that they can’t imagine anyone asking the type of questions that could effectively counteract and even discredit those arguments even during a public process where such questions are commonplace. Too many participants have presented themselves in front of CRTC proceedings ill prepared and incapable of properly answering the Commission’s questions, mumbling and stumbling their way through their poorly worded and often incoherent answers. This self-centered perception of the subject matter not only affects the current presenter’s performance, it can also alter the Commission’s perception of the presentations to follow. I’m not interested in following someone who bombed so miserably in front of the CRTC that my own presentation might be completely ignored, and all of my hours of preparatory work are suddenly transformed into a monumental waste of time. Restrictive subjects of discussion, extremely long and difficult preparation times, potentially falsified evidence submitted in confidence, conflicts of interest, and shoddy presentations and rebuttals by the participants. There’s no point for me to even try to present to the Commission an effective argument against Usage-Based Billing and Aggregated Volume Pricing under these nearly impossible conditions. My time would be better spent expressing my objections against the UBB and AVP fraud outside of official government proceedings with the hope that someone in government with enough power to implement true reforms against this broken down system will sincerely pay attention to what I have to say. And if UBB or AVP does become the norm, I might consider pledging allegiance to another nation, one whose national broadband strategy is more in tune with my future aspirations. There’s no point in me continuing to be the citizen of a country that would deliberately hold back my growth both as an individual and as a productive member of society. And chances are I’m not the only person considering a move to greener digital pastures. On March 23 2011, Mark Goldberg posted a response on his blog to my video “The UBB Deception” where he objected to many of the items presented in the video, even calling the entire presentation a propaganda piece. This is the propaganda piece’s rebuttal to his post. We’ll begin with what he calls my “pseudo-facts” concerning networking equipment. I stated in my video that networking equipment doesn’t really care how much data actually flows through them. Not only do I stand by this statement, it is “in fact” the case not only with enterprise and industrial equipment, but also with consumer grade equipment such as home routers. Mr. Goldberg used home routers as an example of network congestion, mistakenly believing that if two people in a household tried to watch a high definition on-line video at the same time, the home network will have trouble handling the load. However, what actually becomes congested is only the Internet connection itself. If you were to transfer huge amounts of data between two computers connected to the same home network, the speed of the data transfer will be on average between five and ten times faster than the transfer speed over the Internet. Your home router is not suffering from congestion problems. It’s actually being underused. Moving on to the corporate side of things, enterprise and industrial networking equipment — when properly configured and maintained — can handle between 0% and 100% data transfer rates with no ill effects and no increased operating costs. The gear is neither a high pressure pipe nor a high voltage electrical conduit, so it simply can’t wear down from the data flow. And under the (very) rare circumstances when there is network congestion, the gear just shrugs it off, and most users don’t even notice the congestion. Corporate level Internet services are used by many businesses such as financial institutions, retail chains, television channels, and yes, other Internet service providers. The gear can handle just about anything you throw at it at minimal fixed costs, which includes hundreds of thousands of individual users, but again only if the equipment is properly configured and maintained. That’s how it works in a competitive and competent business environment. Or at least that’s how it should work, which makes you wonder what’s the problem with the large corporations that constantly complain about experiencing congestion issues on their internal networks, the same networks under which Usage-Based Billing will apply. What? You didn’t know that Usage-Based Billing had absolutely nothing to do with the Internet itself? And that UBB is all about adding a highly lucrative revenue stream to their existing internal network, a network for which third-party Internet service providers already pay for their access in full each and every month? Someone must have skipped over that part during the CRTC hearings. It’s nice to see that Mr. Goldberg is so concerned over the budget limited customers who, under my speed based pricing philosophy, might never enjoy the benefits of higher speed tiers because of the extra cost. Too bad he fails to mention that under the existing UBB pricing scheme, not only are the higher speed tiers still more expensive than the lower speed tiers, the same deprived low speed customers will now be charged as much as five dollars per Gigabyte if they ever go over their already ridiculously low monthly data allowances! Let’s be realistic here. Does it really cost the large corporations up to $5 per Gigabyte to transfer data over a private network that they own and control? And if the large corporations are experiencing congestion problems caused by the 6% market share the independents currently possess – congestion that has yet to be proven beyond a reasonable doubt in any public forum – then maybe the large corporations should have never oversold their network capacity in the first place, or at the very least have hired people competent enough to properly manage their network infrastructures so they wouldn’t find themselves in a pile of congestion issues in the first place. I make no apologies for mentioning the former and future positions of the CRTC commissioners in my video. I had to find a quick way to point out that these individuals find themselves in a position of conflict of interest every time they preside over matters that can affect the prospects of their former and future employers. If the CRTC were operated more like a courtroom however, the affected commissioners would have no other choice but to sit out of any proceedings where they can be unduly influenced by their former or future ties with the participants. The decision over Usage-Based Billing is possibly the worst decision the Commission has ever made in its entire history, one that even I had never expected considering my extremely positive experiences with the Commission during these last few years. This decision now allows the owners of the “last mile” to charge exorbitant and unreasonable usage fees for access to a private network which already generates a profit each and every month, with the added benefit of protecting the large corporations’ non-Internet based media outlets, and possibly wipe out what little competition this nation already has. At the very least, Usage-Based Billing should have never been imposed on the independent ISPs who already pay in full for their access to the internal network each and every month. But now, we run the very high risk of ending up with no Internet competition at all, and be forced to choose between no Internet service and no cash in our pockets. And as demonstrated at the end of my video, no control over our own nation. Think about that during the upcoming election campaign. First, let’s disclose the entire third paragraph on page 11 so that there aren’t any misunderstandings as to what Mr. George Cope, President and CEO of BCE, had to say. Notice that there’s no mention at all about any congestion problems? In fact, they speak as if they’re fully aware of the increase in bandwidth consumption that’s about to occur in the coming months, and even appear to be fully prepared for it. Even worse, BCE is attempting to monetize video content created by third-party content providers who won’t see a single penny of all the money that’s about to be generated through the UBB scheme. It’s a pretty disturbing situation to say the least. With thanks to the very few who took the time to read and report on the content of the transcript which so many others (including me) have overlooked. Four days after releasing the video “The UBB Deception” on YouTube, it has now surpassed 4,000 views. The message is getting out! We’ve added a new section: The FUQ, or “Frequently Unanswered Questions” (pronounced “Fooq”). This section will contain a list of questions concerning Usage-Based Billing that the large corporations never seem to be able to answer. We’re also working on providing a captioned version of the video, and plan to translate the video into French. But while the English captioned version shouldn’t take too long to complete, the French version will take more time since not only must the dialogue be translated, but so must all of the English text on the screen. Once all this is completed (or at least very close), we will begin work on the next video in the series, a short two minute explanation on how independent Internet service providers can provide service to your home over the large corporations’ infrastructure.